My favorite rocket, when I was in high school, was a design by Tom Milkie published in the March 1969 issue of Model Rocketry magazine. This was a very unusual design in that the two motors were mounted ahead of the fins, canted outward 15 degrees from the body tube. 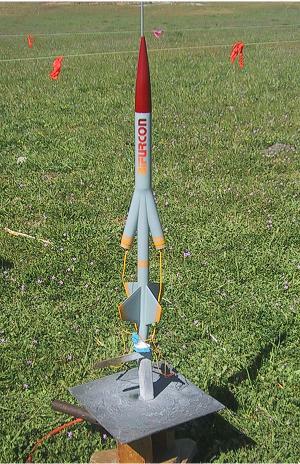 The design looked cool and was unlike any other rocket I had in my fleet. So I built the Bifurcon. Fast forward a number of years, and I am once again building rockets. But despite having graduated to high power, I still had the fondest memory for the Bifurcon. So I decided it was time to build another Bifurcon. I am currenty working on an article on the construction of the Bifurcon.